What if the first day of your relationship was the only day you had? To be honest, I had such a difficult time trudging through the first thirty percent of this book. No matter how hard I tried (and believe me, I did), nothing about the characters and plot made me want to keep on reading. I remember being quite disappointed because I had such high hopes for this novel - a good friend of mine (who has amazing taste in books) is hosting the blog tour after all! 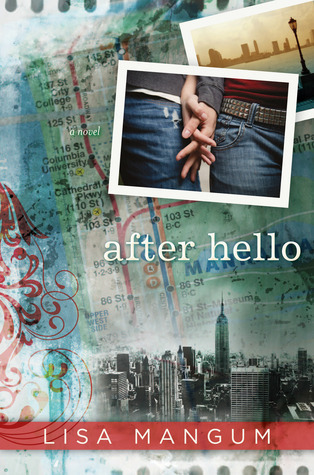 Looking back, I have no idea if maybe I was just tired or I simply wasn't in the mood to read when I picked up After Hello, but man, after thirty percent and I still found myself unable to connect to any aspect of the story, I promptly gave up. Life is too short to force yourself to finish reading a book that simply didn't capture your interest, right? Wrong. Life is never as simple as it seems, ladies and gentlemen. (Check me out - I'm pulling a Sam with this contemplative line of thinking!) I thought I was satisfied with my decision to DNF After Hello, but next thing I know, I see reviews left and right about how this book is such a precious gem. Color me intrigued - surely all these people (and believe me, there were a lot!) were talking about a different book! Anyway, a few days after giving up on After Hello, I found myself ultimately deciding to give it another chance... and wow. Suffice to say that I'm extremely glad I did! Now that I think about, one thing that made me initially a bit wary towards this book was how improbable the entire setup was. Girl meets boy, boy then enlists her help, girl messes up, and now boy and girl must team up on order to save boy's older brother's job? Yeah, I remember my eyebrow shooting up. I have pretty much mastered suspending my disbelief after reading all sorts of genres, but I vividly recalling not liking this premise. At all. It was just too... out there for me, most especially since this was a contemporary read. After finishing the book however, this aforementioned fact is what makes the book such an amazing read - while seemingly improbable, you would be surprised that similar instances have occrured to so many other people. That's the beauty of life - you can only expect the unexpected. I have no idea why it took me so long to realize this and why it took me so long to appreciate the sheer genius that is this book, but I'm really glad I did. I may have been late to the After Hello party, but at least I made it! It took a while before I warmed up to the characters, true, but wow, they left their mark on me. I can't help but love how unafraid Sara is - when an adventure makes itself known, she embarks on it with no hesitations whatsoever. That kind of bravery is just plain admirable! I also adore how attuned Sam is to life as a whole - this truly shows that maturity and being wise has nothing to with age. I'm not lying when I say that every single time Sam talks about life, or shares an insightful thought, I had to pause to let what he said sink in... and I had to give myself time to reflect on my actions in the past. I usually read very fast, but I really had to read this book slowly - I wanted to soak in all of Sam's words! Sometimes, people make themselves a part of your life, make a mark, change who you are forever, and leave. This is something I'm sure everyone is well aware of, but the way Mangum tackled this concept is nothing short of exquisite. Not only did explore the beauty that is the city of New York, she was also fully to explore the lives of her two main characters. Here we have two teenagers, still trying to figure out who they are... and through each other, they're almost there. Never mind that they only had a day - that will never change the fact that their lives have been forever altered by each other. Sam and Sara were able to grow - they finally faced their demons, learned to trust other perople, and look forwards to whatever may face them in the near future. I don't think it's possible for me to find words beautiful enough to describe this masterpiece of a novel. Everything - every word - was perfect. I love Sam. I love Sara. I love how they got to know each other through the streets of New York. I love how they learned more about themselves through each other. I love Mangum's writing. This is one book that you're going to remember forever - trust me.